Remodelling or creating a new bathroom and worrying about the costs? These tips will help you stick to your budget and maybe even save some money in the process. Just think of all the luxury toiletries you can spend your savings on instead! Take time to think about how you use your bathroom on a daily basis. If you only enjoy a soak in the bath once in a blue moon, do you need one at all? Or, if you usually have showers but love to unwind in the bath at the weekend, why not combine the two with a spacious shower-bath and save on the cost of a separate shower? Or, you could create a walk-in wet room instead. If you do use both, consider an L-shaped shower-bath. 'It’s the best of both worlds without needing a separate shower tray and cubicle.’ says Rob Tyson, interiors advisor for Victorian Plumbing. Shop around for the best deals, putting your suite together from different suppliers and clearance sections. ‘Stay with white ceramic and you can mix and match pieces from multiple sources,’ says self builder and renovator Michael Holmes. Consider what you use the most, and spend the most money on that. You're likely to use basin taps a lot more than bath taps, and floor tiles will need to take more wear and tear than wall tiles. So spend where it counts for a bathroom that will last. If you don't want to knock walls down but you want to make your bathroom appear bigger, use visual tricks to give the illusion of more space. Choosing the right size tiles is one way to do this. 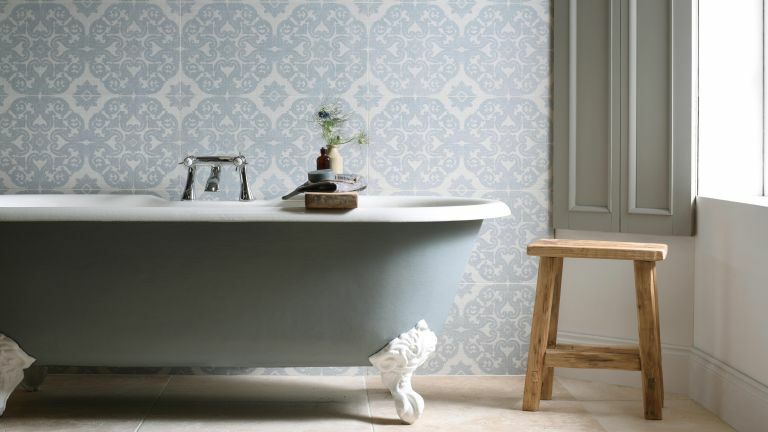 ‘Large-format wall tiles in neutral shades can make the room look larger and more luxurious,’ says Sian O’Neill, of Topps Tiles. Don’t reposition anything that doesn’t really need to be moved as it will add to plumbing costs. Moving the toilet would involve relocating both the toilet drain/vent and waste water systems, and also supplying water to its new spot. This can prove to be very costly. It can be hard to tell the difference between natural materials like stone and wood, and their imitation counterparts. Opting for porcelain or ceramic tiles that look like stone, marble or wood will offer you the same aesthetic as the real thing but at a fraction of the price. Effect tiles are also lower maintenance as they don’t need sealing to protect them from water damage. Attention to detail when planning your space means you’ll get it right first time, which can save you money correcting mistakes later. Make use of free online planning tools, or work with a company that offers a free design service. 3D plans are a great way to see whether your choice of products will fit. Talk to your plumber or fitter before you buy, too, as they’ll be able to tell you if what you want is suited to your space. Once you're in, there are lots of specially designed taps available that can reduce water usage by half compared to regular taps, saving on your water bills. And fitting a flow restrictor to your shower will limit the amount of water you use without compromising its performance. A Bristan shower flow restrictor from Victorian Plumbing costs £7.95, and limits the fall of water to six litres per minute. Other water-saving gadgets include the Hippo, which is popped into the toilet cistern to reduce the amount of water used in a flush by up to three litres.